A week or two ago I posted on Twitter about a Genesis Wave deck I’ve been playing in Modern and about how much I’ve enjoyed it. I am confident in saying that this is the most fun I’ve had playing Modern since the format’s inception. I got a lot of requests for the list and discussion, so this week I thought we could take a break from the B&R fervor and do something a little different. This article will be much lighter on the finance info than it normally is. Instead, we’ll be looking at the “NyxWave” deck. Hopefully this is far enough off the beaten Modern path to be interesting to most. Next week we’ll return to regularly scheduled programming. If you’ve been following this deck online at all, you’ll see it’s sort of a hybrid between early Genesis Wave builds that ran the full set of BTEs and Elvish Visionarys and Woo’s recent list that focused more on establishing Primal Command locks. I’ve chosen a middle ground that I feel encompasses the best components of both lists. Our mana ramp comes from the Utopia Sprawls, Overgrowths, Arbor Elves and Voyaging Satyrs. I think I’ve reached a point where my favorite three cards in an opening hand in Modern are Forest, Arbor Elf, and Utopia Sprawl. Why is that so powerful? T2: Land, Utopia Sprawl on untapped land. Tap Sprawl land for two, untap with Arbor, tap for two more, for a total of four mana on T2. That means turn two Garruk Wildspeakers (which untaps both lands for another three mana) or Harmonize. You’re in great shape after doing that, and even if you don’t manage to win, at least you had a ton of fun losing. Four Arbor Elves and four Utopia Sprawl are untouchable. They form the backbone of the deck’s mana acceleration, and are part of why Garruk is so good in this list. The Overgrowths and Voyaging Satyrs are also very powerful, but their numbers are more flexible. I feel that four and four is probably too many, but I haven’t figured out what the correct number is yet. I liked three and three, but I could see possibly dropping a Satyr. Garruk Wildspeaker is amazing, and casting him reminds you of why he was the best Planeswalker in Lorwyn. Untapping two naked lands is reasonable, but when one of those lands has three enchantments on it and the other land is Nykthos, his +1 is just silly. Garruk is almost always behind the silly mana counts that reach into the mid and high teens. Then when you don’t have a use for more mana this turn, his beast token is way overpowered for the cost. It’s great at threatening opponents with lots of removal and plays solid defense on the turns where you don’t have any of your mana sinks. What’s more, a single +1 from his starting loyalty puts you in Overrun territory. It’s not uncommon to cast him, tick him up once, then just Overrun them to death the next turn. It’s not as flashy a win, but it’s efficient. Don’t ever cut Garruk. He’s one of the best cards in the deck, and he pays you in spades for all those auras. 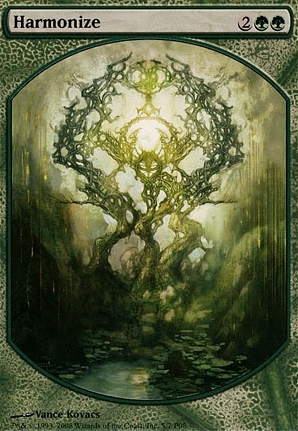 Sylvan Scrying is an excellent 5th Nykthos. I’ve been pretty pleased with the card, having run as many as three copies in the past, but space is limited. I’m still not sure where the correct number is, but I know it’s between zero and three. Even if you already have Nykthos in play, it’s far from a blank. For two it fetches a second shrine to really make your mana explode. When you’re not in need of more shrines, go get a Kessig Wolf Run and just trample them to death with an Eternal Witness. Or perhaps you’ve got all the mana in the world but need to do something big this turn and KWR isn’t going to cut it? Find your Horizon Canopy and draw another card. That line sounds expensive, but with a few auras, an elf or two, and a Garruk, it really isn’t. It’s completely conceivable to generate sixteen mana, fetch Canopy, use it to draw a Primal Command, Command a land to the top of their deck and grab another Witness, Witness back the Primal Command, and then cast it again. Speaking of which, Primal Command is half engine, half win condition. You’re never upset to cast it, although it is admittedly never stupendous. All the options are solid, and I’ve used each and every one of them several times. Having outs to random enchantments and artifacts are great, as is the life if you only need another turn to go off. Most of the time you’re flipping lands and fetching Witness to do it again next turn, as it locks their draw step while allowing you to keep advancing your board. Command provides a useful way to slow your opponent’s development in the mid-game while continuing to push towards a critical mass board state, and can also function as a semi-win late in the game when you can cast and recur it more than once in a turn, blanking your opponent’s draw step for a turn or two while you add more threats and either draw into a Wave or just fetch a Prime Titan. Harmonize is awesome every single time, and my next revision to the list will probably involve playing more copies. If this deck has taught me anything, it’s that I severely wish this card was legal in Standard. When you can cast it on turn two and Witness it back the next turn, you know you’ve got something special. The biggest tension is between this and Primal Command. Primal Command *does* more, but it’s occasionally lower impact than you’d like, and typically your true win is Wave, which Harmonize finds and Command doesn’t. On the other hand, Harmonize can draw you two lands and an elf while Command can start a chain that leads to you taking complete control. I’m not sure yet what the proper split is here, and I’d love input from others who have experience. Genesis Wave is the true engine of the deck, and is a sight to behold when it works. You typically want to hit it for at least eight so that your Craterhoof comes into play. Often the first wave won’t flip him, but instead will give you some combination of lands/Garruks/Witnesses that will allow you to cast a second Wave immediately, typically for much larger. Remember that when you flip a second Nykthos or Garruk, you can sac the old ones so you get fresh activations out of the new copies. Beyond Arbor Elf and Voyaging Satyr, BTE acts as a mana source too, although less obviously so. She adds double green for devotion which really helps power up your Nykthos fast, and is part of all your most broken draws. I’ve had seven card hands that I unloaded with on T2 because they included a few BTE and Nykthos. Even the simple hands allow you to go BTE into Satyr, which typically sets up a big T3 unless your opponent does something quickly. The downside is that she’s obviously not a great topdeck. Sometimes you just need the devotion so you’re happy to see her, but more often than not it’s a pretty dead draw. Other options here include Elvish Visionary, Strangleroot Geist, Fertile Ground, Wall of Roots, more Sylvan Scrying, or something else entirely. All of those reduce your bananahands, but have their own upsides. I recommend goldfishing a few hands to see what BTE can do before you condemn them though. Eternal Witness allows for some of the best value plays in the deck. There are games where you play her on T2 to get back a fetchland just so that you’re putting mana symbols on the table and keeping the spice flowing. Other games she enables your Command chains. When you Wave for six or seven, a single Witness in the pile returns a Wave to your hand so that you can do the time warp again. When you’re behind on board you can Witness returning Garruk, then play him to make a beast, going from no board presence to threatening. Witnessing Harmonize feels spectacular. There’s just no shortage of jobs for a 2/1 Regrowth. Acidic Slime is a one-of down from the four Woo plays. The card is strong, for sure, but it’s easy to end up in games where it’s just too low impact. I like having the single copy to be able to command for it where it’s necessary, but in general I’d rather draw cards that more directly advance my Wave plan. Prime Times are Prime Times, I feel there isn’t a lot to say here. As vulnerable as he is against some decks, the KWR he fetches is rarely useless, and plenty of times they simply don’t have an answer. If you untap with Prime Time, you’re probably swinging for twenty or more damage on him alone. The Craterhoof is your “I win” off of Waves, and very rarely disappoints. Even if you only have two untapped creatures you can attack with when he comes into play, typically your wave(s) dumped a lot more bodies into play that turn and you can still swing for lethal. Hardcasting him isn’t out of the question either. I’ve beaten RG aggro decks that were at eighteen life by not blocking an attack for twelve, untapping, hardcasting Craterhoof and just killing them out of nowhere with a few Elves and a Witness. Your opponent is usually so concentrated on worrying about your combo that they overlook your ability to just Hoof them to death on the spot. The manabase isn’t anything noteworthy, and I’m quite happy with it at the moment. I tried it with only three Nykthos, but I’m pretty sure that’s completely wrong. Drawing a second copy isn’t bad in this deck, because you’re often going to completely fine trading a land drop for a boost in mana on a critical turn. Activate the first Nykthos, play the second, then activate that one for megabonusjackpotmana. If the sideboard changes significantly it may require mild tweaking, but for now it functions just as it should. It’s possible you could go up to twenty-two lands, but that should only happen if you’re adding more velocity to the main. Your sideboard with this deck is mostly trying to proactively answer a few things: Robots, Graveyards, Deceiver Exarchs, and counterspells. Mine is geared for my local meta, so feel free to tweak yours as necessary. Playing this deck is a blast. Your goal is typically to generate giant piles of mana and spend them on everything possible as fast as you can. Make sure you’re counting your potential mana on each line of play. Oftentimes you’ll be faced with situations where one line nets you five, another six, and a tricky-to-see third line will find you seven or eight. Remember to do things like cast Arbor Elf or Utopia Sprawl before activating Nykthos, as they’re a free roll, and they’ll even add mana if you can use Nykthos twice. Be wary of Tectonic Edges. Tec Edge can only destroy nonbasics and only if you have four or more lands. This means your auras should be on basic forests, and feel free to hold your fourth land in hand until you absolutely need it. Holding the Nykthos as your fourth land until you draw the Wave when playing against Tec Edge is almost always the right play. One thing I’ve seen asked is “why not Tooth and Nail?” It’s a pretty similar spell. Pay nine mana, kill them on the spot. Genesis Wave involves all the triggers, can whiff, etc etc. I’ve been pondering this a good bit, and I believe Wave is (narrowly) the better option. My issue with T&N is that it requires you to play dead cards, and occasionally will lose even if you resolve it. There are two basic routes you can take; Emrakul + Flame-Kin Zealot or Triskelion + Mikaeus. Trike and Mike looks like the best option on the surface, until you realize it gets hosed by graveyard hate or Path, which is definitely not what you want in an all-in win condition. That leaves us with Emrakul + Flame-kin. I’d guess that 97% of the time you put those two into play you’re going to win, but there are still those times you won’t. Your twin opponent may just Exarch the Emrakul before attacks, then untap and kill you. There will also be games that you draw the Flame-kin (or whatever haste enabler you opt for) and wish it was anything you could actually cast. Emrakul isn’t technically a dead draw, as fifteen is certainly viable, but I wouldn’t want to lean on that. 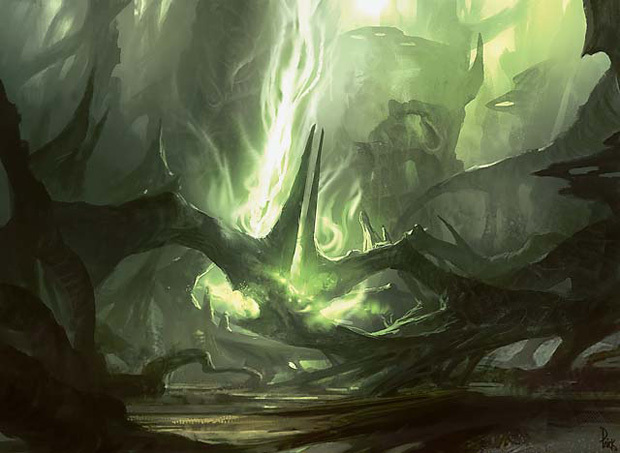 Fifteen for Emrakul is a far cry from eight for Craterhoof. There are of course the games you’ll be able to pay seven for just the back half of T&N and slam Emrakul + whatever into play and dare your opponent to answer it in a single turn. I’m not sure how often those come up, or how often they win, but it can and will happen. The knock against Wave is that it seems more expensive, and won’t always win you the game. I agree that paying nine for T&N seems more of a lock than with Wave, but I don’t think I’ve ever actually lost a game I Waved where X=6. If in those six cards you don’t find the tools necessary to recur and cast the Wave again that turn, you probably at least put some very relevant permanents into play. With only twenty-one lands, it’s not often that you’re going to flip six dead cards. You can also wave for less than six and often get the help you need. Four will put nearly all your permanents into play, and even three will get you most of your creatures, including any Witnesses to get back the Wave again for next turn. Waving for less than eight isn’t exactly preferable, but it’s still often going to be enough. You also aren’t required to keep any dead cards in your deck. Every card in your list is completely castable without Wave. Finally, Wave attacks on a multitude of vectors. You’re filling the board with threats, massive amounts of mana, enabling a Command chain, and presenting a hasty lethal threat that turn. Even if they can deal with the Craterhoof, they still have to worry about the fifteen creatures in play, the Garruk, the KWR, and the thirty+ mana you now have to loop Command three times. Ultimately I’d say the difference between T&N and Wave is only going to matter on the margins. I am pretty sure Wave is slightly stronger, and I know for sure it’s more fun. Both get hit by different hate cards out of boards, so they’re a wash there. With a deck like this, you can really just pick whichever one is more fun to you. I’ve spent 2500 words telling you how awesome this deck is. Now I’m going to tell you what’s a bummer. I’m pretty sure one of the worst cards in the format for this deck is Cryptic Command. It bounces aura’d lands, it counters everything you do without letting you pay your way out of it (unlike Mana Leak), and it fogs your Craterhoof turn. You also don’t want to see piles of Lightning Bolts, Helixes and Paths, since disrupting your small dudes early will typically disrupt you long enough for your opponent to beat their way in with Tarmogoyfs and Wild Nacatls. Deathrite Shaman and Liliana were actually not at their best against you, so you weren’t terribly upset to play against them. Now, instead of those, you are more likely to face some very bad matchups. I’ll be watching the format closely to see if I can tweak the deck to handle the impending changes, but a sharp rise in Cryptic decks could put this on the backburner. In the meantime, I encourage you to give this a whirl at your local Modern tournament. You’re definitely going to draw a crowd when you say “add seventeen mana to my mana pool, cast Genesis Wave for fourteen” out loud. Have you thought about “Insidious Dreams”? I know you’d like it in another color, but is it a real problem with fetches (Verdant Catacombs) and a swamp, Utopia Sprawl and possibly Nykthos ? “Insidious Dreams” works well with “Genesis Wave”, allowing you to stack you deck the way you want at the end of your opponent’s turn (depending on how many cards you discard), draw the Wave first during your draw step, and go the way you foresee. I assume it’s a step in another direction (graveyard strategy) , but maybe it can steal the “Harmonize” spot without changing anything else. Insidious Dreams isn’t Modern legal. If you’re going to fetch Wolf Run with Primeval Titan, why not run Inkmoth Nexus as well for old time’s sake? It’s not needed. Your Kessig attacks are basically always capable of being lethal. The tension comes from whether they have removal from the creature you’re pumping, not whether it’s enough damage to finish the job.